Grand Velas Riviera Nayarit takes spot no. 5 in the world rankings and is in 2nd place in Mexico, while the Marival Residences Luxury Resort is at no. 18 and the Hard Rock Hotel Vallarta is at no. 24 in the national listings. 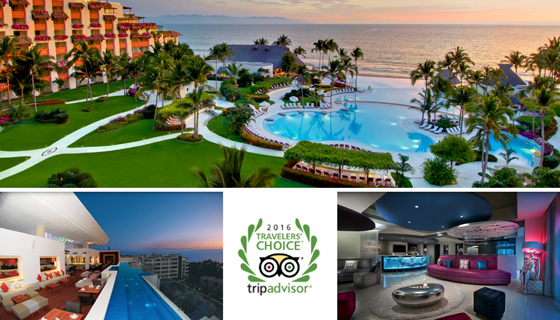 TripAdvisor, considered the largest travel website in the world, posts its classic Top 25 in different categories to spotlight the best in tourism; this time around they focused on all-inclusive properties, where the Riviera Nayarit Hotels took center stage. Within the category of “Top 25 All-Inclusive Resorts – World” the only hotel in the Destination is the Grand Velas Nayarit in Nuevo Vallarta in 5th place. There are a total of eight Mexican hotels on this worldwide list. Obviously the Grand Velas Riviera Nayarit is also on the list of “Top 25 All-Inclusive Resorts – Mexico,” this time in 2nd place. That list also includes the Marival Residences Luxury Resort in 18th place and the Hard Rock Hotel Vallarta in 24th. The Top 25 lists highlighting other topics such as most popular, most luxurious and exceptional service were published earlier this year, where the Riviera Nayarit hotels also held their own. TripAdvisor is considered the largest site of its kind because it has over 340 million unique monthly visitors, about the same number of impartial reviews in 45 countries and among the options there are five million establishments.